A Pathfinder Society Scenario designed for levels 1-11. Many centuries ago, the legendary sorceress Hao Jin crafted a museum demiplane, ripping locations from across Golarion to add to her personal collection. When she vanished without a trace, the demiplane began falling into disrepair. Ever since the Pathfinder Society gained access to this realm seven years ago, its agents have been gradually exploring the demiplane's wonders, meeting its people, and cataloging its preserved historical relics. Former Pathfinder Master of Spells Aram Zey has just made a terrible discovery—the demiplane's deterioration has reached a critical stage. Unless the Pathfinder Society intervenes, the entire demiplane will rip apart violently, ejecting most of its contents into the Astral Plane and killing everyone inside. Yet it isn't as simple as sewing the demiplane back together with some metaphysical thread. Powerful forces from both within the tapestry and outside of it seek to hasten the destruction or profit off the chaos, and the impending apocalypse has thrown the tapestry's civilizations into turmoil. Release: The Hao Jin Cataclysm will be available for sale in August 2019. Hi all! Here's the list of maps that appear in this adventure. Not even being subtle about the death by box text anymore, eh? Are there any scenarios other than the one whose map you mention that we should maybe try to run for our local players before Gen Con that tie in to this one? Thanks very much if you see this, and no worries if not! Why yes there are. All of the following impact the way that NPCs respond to the PCs during #10–00. I assume the custom map will appear in the PDF without any room labels or pertinent information? I might get a print-out of it, and I rather use a clean copy that the copy in the scenario it originally appeared in. The image in the original PDF can be cut-n-pasted out without any of the overlays. How many tables minimum to run this at a convention? Seems like the number can vary with the interactives. When will this actually be available for those of us who are GMing it at GENCON? GENCON is only 17 days away!!! I'm currently doing the final review pass for this adventure, which means it should be ready for us to package and upload within the next few days. We finished up 7 of our 13 new scenarios last week, and the others are hot on their heels. 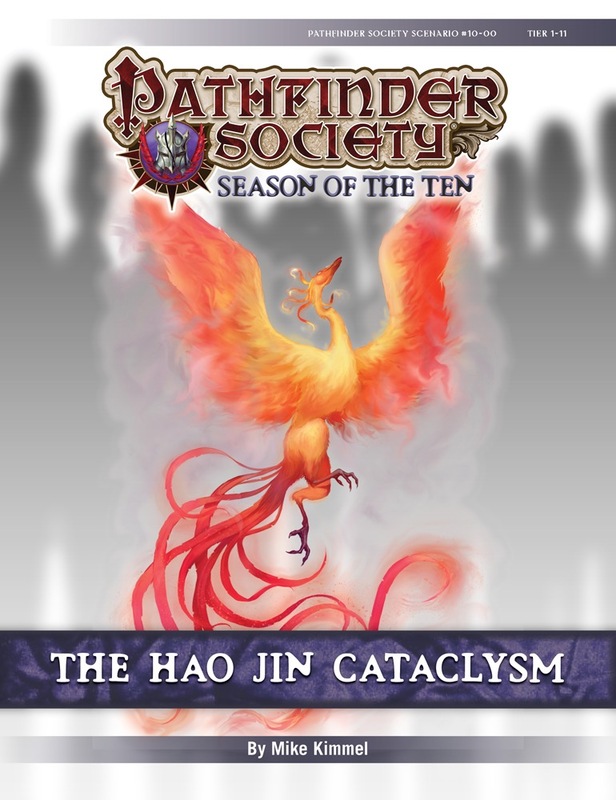 The Hao Jin Cataclysm's minimum table number is four. The desert side of Battlefields or the River side of battlefields? I'm thinking of 3D terraining. For the record, the Paizo staff has been doing a remarkable job the past few years. Four or Five years ago we were getting the new scenarios the Friday before GenCon. One year I got the special the Sunday before (2014). Wasn't a gripe, Swiftbrook, they are doing great especially with the Playtest and three specials this year. It is my only scenario left that I haven't received and Im just anxious! Thanks John for your quick replies they mean a lot! It is now after GenCon. I assume it was made available then. It is not yet available here. I am GMing at a con in early November so I need to start reading. Any idea when Paizo will release this module here? This scenario will not be made publicly available for a year. During that time, access will only be provided to GMs who are running the scenarios at approved conventions. After next year's GenCon this will become available for public purchase. If you're running it at a convention and you don't have access to it yet, talk with your convention organizer. Thanks, this is a sanctioned Convention. I'll contact the organizer.